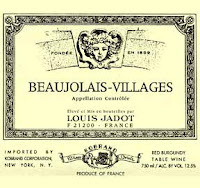 A lot of people are saying that the 2009 Beaujolais vintage is one of the best vintages the region has seen in quite some time. Even the village wines seem to be getting quite high scores in the wine press, so it should be interesting to taste this wine. The color of this wine is like most fresh Beaujolais, very bright purple and a bit translucent. On the nose I get some jammy smelling berry fruit and hints of soil and concrete. The fruit is quite hard to distinguish and kind of smells like a candied raspberry mixed with blueberry. 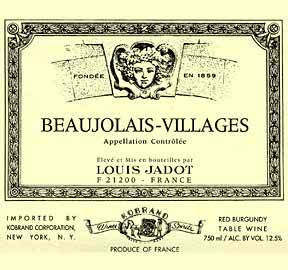 It's kind of got a bubble gum type thing too, which to me is very common with Beaujolais. It's a very nice bouquet and one that's packed with ripe fruit flavor and other subtle complexities. On the palate the wine is packed with ripe raspberry and blueberry flavors. The texture is quite light on the entry and mid-palate, but then on the finish there is a dose of tannin and a richness that kicks in and helps the wine to finish with a bit more substance.